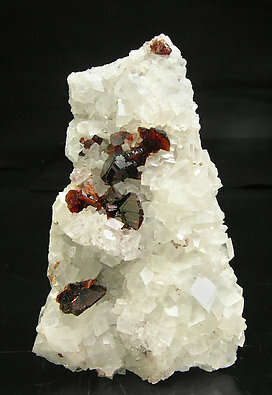 Huge and well colored crystal of Fluor-uvite very well placed on the typical white Magnesite matrix. 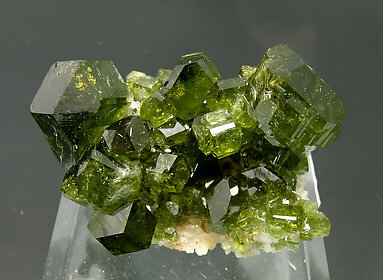 Slightly tabular doubly terminated Fluor-uvite crystals with minor prismatic faces and a very flat predominant rhombohedron. 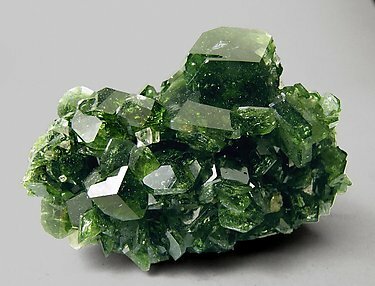 They are on a matrix of a very sharp rhombohedral Magnesite crystals. We’ll send to the buyer the original label and also a copy of the computer card with the full text in the collection catalog. 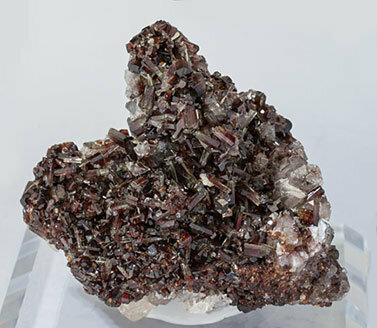 Aggregate of Fluor-uvite crystals with a prismatic shape, transparent, very bright with an intense red color, and with colorless and transparent rhombohedral Magnesite crystals. Large crystal size, not a bad color and good position on the Magnesite matrix. So it is a perfect sample for a classic mineralogical specimen. A floater. 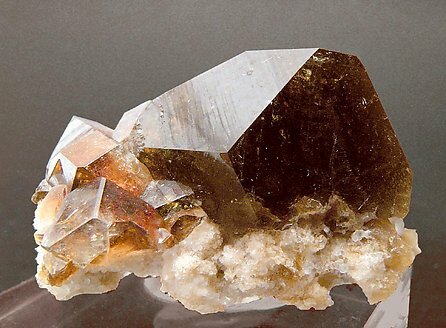 Crystal is very well shaped and in one of its front faces has a negative crystal forming a geometrical entrance. 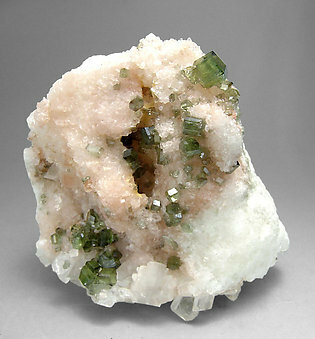 The group of crystals forming the base is partially covered by little rhombohedra of Magnesite. This sample is from an accredited collection and we'll send the corresponding label with it. Lenticular crystals of very well defined faces and edges. 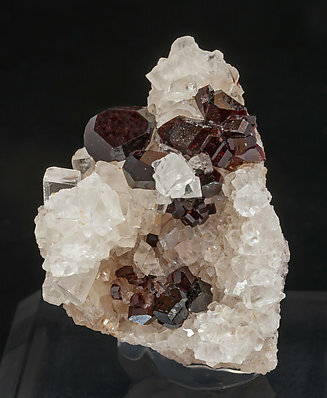 They have an unusual deep red color with high transparency and are on a matrix coated by rhombohedral crystals of Magnesite. Esthetic group of crystals formed by the rhombohedron and a very short prism. The group is on a matrix of clear crystals of Magnesite. 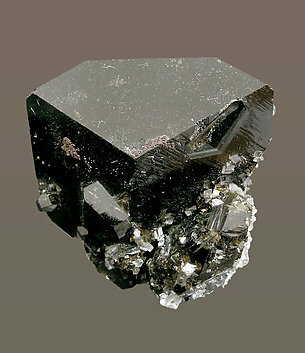 Very short prismatic Fluor-uvite crystals of almost equidimensional aspect resembling a garnet. 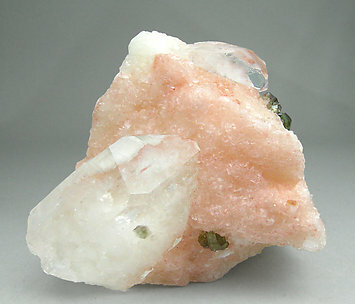 The crystals are very transparent and have good color that contrasts with a matrix of rhombohedral pink crystals of Magnesite and with Calcite. 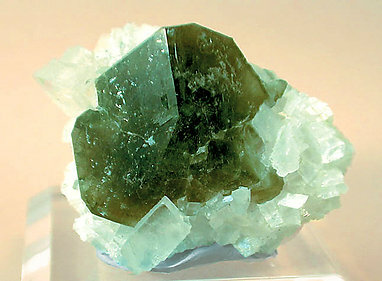 Group of Fluor-uvite crystals with a dominant flat rhombohedron, bright and of a very deep green color, with small rhombohedral crystals of Magnesite. Very short doubly terminated crystals of Fluor-uvite. 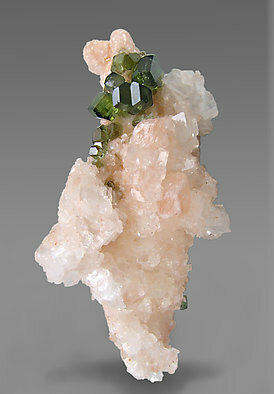 They have perfect rhombohedral terminations that are bright, transparent and have excellent deep green color and are on a matrix of white sharp rhombohedral crystals of Magnesite, with orange Calcite and right-handed crystals of Quartz, the biggest one with an included small crystal of Fluor-uvite.